"Sonic! What are you doing in a car?" 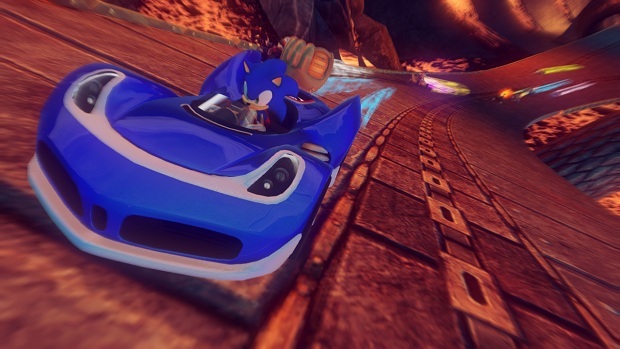 We know that Sonic & All-Stars Racing Transformed is coming out on more-or-less every platform this Holiday, but it appears that Sumo Digital has paid special attention to the Wii U version as shown in the racer's latest trailer released today. Along with exclusive multiplayer modes, Racing Transformed on the Wii U will also allow players to switch screens from their TV to their gamepad seamlessly (if the video is portraying the switch accurately) and even control vehicles via the gamepad's motion control feature. Although I've never really cared much for Sonic racing titles, Racing Transformed doesn't actually seem too bad; maybe the 10-player multiplayer mode will prove a hit among kart fans until the inevitable release of a Mario Kart U.